I just found out about the City Walks with Kids Guides and wonder how I ever managed to travel without them. It is such an ingenious concept! Instead of a book, it is a pack of cards you can take along for the walk you want to go on. The walks are cleverly laid out so that they are easily done with kids and take you to famous and not so famous places that the whole family can enjoy. I love the way the texts are written — they are packed full of little anecdotes and stories that will get everyone’s attention. I am definitely picking up City Walks with Kids in Paris. Though I live in this city, I have never used a travel guide to explore it with my kids, and it will be a fun thing to do this summer! 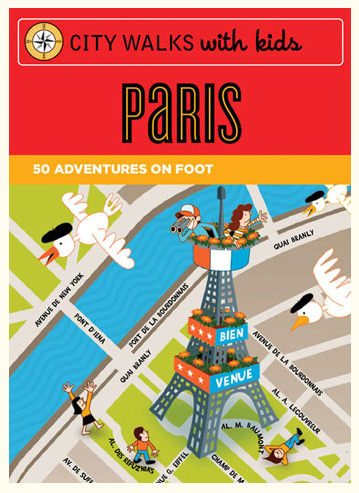 City Walks with Kids in Paris and City Walks with Kids in London are available from Smallable. The other Cirty Walks with Kids (Washington, San Francisco and New York) are available from the Chronicle Books website. We have both the London and Paris cards. While we live in London we like to let our daughter pull out a card to decided what we should do if we have a free weekend. We like to head to Paris at least once a year and have found these cards to be very valueable. My cousin recently took her daughter to New York and we recommended these cards. Upon their return they said they were a must for the next time we plan to go. i have the nyc one, both kids and adults. they are wonderful! I have seen these before as well, and they look really cool. How fun to be a tourist in your own town — I’m sure you will discover things you’ve never known existed. I should get the London one! Nice to share thank you ! What a wonderful city for a family trip! The walks are wonderful and full of interesting tidbits. Visit http://www.theeducationaltourist.com for tips on visiting the City of Light with kids! See the $3 downloads for visiting the Louvre and France with children. These downloads will help keep the kids engaged and remember their trip!